CLICK HERE for Historical Photos of Salem. The George Edward Anderson Collection of photographs in the Special Collections at BYU has almost 200 photographs of Salem taken by Mr. Anderson. Some are of the city. Most are family portraits. George Edward Anderson Photo Collection at BYU Type "Salem" in the Search box. Click Here to dowload a history of Salem written by Joyce Henderson for Salem Heritage Day in May 2005. Known as "Summer Spring" by the Indians, and "Pond Town" by early settlers, Salem, in Utah County, was finally named after the birthplace of Lyman Curtis to honor his contributions to the community. The Indians appreciated the fact that the local springs bubbled up through sandy soil in a tree-shaded hollow, even in summer. In the spring of 1851 David Fairbanks and David Crockett discovered this same precious asset. 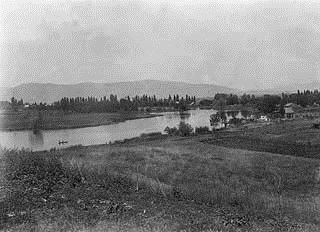 Fairbanks had been assigned to Peteetneet Creek (Payson), where he was to become LDS bishop of the town. The two men continued to explore the area and found a large, clear stream flowing through a hollow. They realized that by damning the stream they could conserve the water that flowed out into swamplands. They soon moved their families and built the first dam, assisted by others from Payson who needed additional farmland. Some crops were harvested that year. Winter and the threat of hostile Indians caused the families to return to Peteetneet, but "Pond Town" had a beginning with the dammed springs. In 1852 the two founders built a second and more secure dam, but by the next year the families had moved to Peteetneet and the new settlement was abandoned. Settlers from nearby Palmyra, fighting drought and alkali salts in the soil, decided to start over at the abandoned Pond Town. George Wilson and his brothers purchased the Fairbanks-Crockett interest and they, along with eight other families, moved to the area in 1856. During that same year, Lyman Curtis, one of the original company of pioneers to enter Salt Lake Valley, joined in the new development with four of his sons. In the next few years two more dams and an irrigation system were developed. Homes were built adjoining one another for protection against Indian attacks. The homes were constructed of adobe brick and lumber from nearby canyons. The fort homes were used until 1870 when the Indian danger had been reduced. Settlers began moving into the town, which was laid out in five-acre blocks. As was common throughout Utah, homes and barns were built inside the town, with fields and grazing area outside. Boys herded cattle on "common grounds." The completion of the Salem Canal in 1869 brought irrigation water from the Spanish Fork River to Salem. Lyman Curtis, who had experience with irrigation in Santa Clara, directed the project to completion. The canal was eight miles long and took two and one-half years to build. Additional water was brought to the area by the Strawberry Valley Irrigation Project, completed in 1916. Popular crops were wheat and other grains, as well as tomatoes and peas for the Del Monte food-processing plant, located between Salem and Spanish Fork. Beginning in 1891, sugar beets were grown extensively for the factories throughout Utah Valley. A "beet vacation" allowed boys out of school to assist in harvesting. Many farmers specialized in growing garden produce or in raising poultry. Local ranchers had grazing rights and permits in the nearby national forests, in Strawberry Valley, and in privately owned property in Loafer Canyon. In the nineteenth century blacksmithing was a much needed service, and there also were immigrants skilled in masonry, milling, and cobblery. Sawmills and shingle mills, molasses producing factories, creameries, and confectioneries have supported families and provided for community needs. The LDS Church started a co-op in Salem in the late 1860s; it operated largely on the barter system until it was discontinued in 1897. Several small stores were operated for short periods of time. In 1908 the Salem Mercantile Company was started by the James Peter Christensen family, which operated it until 1969. For many years the "Merc" used the barter system and issued scrip. In 1946 Melvin R. Hanks started another grocery business on Main Street. Later continued by two sons, this family business also thrived. There were a number of service stations along U.S. Highway 91, and a motel. Through the years the town also had a drugstore, barber shop, and a saloon. A few businesses are still clustered along the highway. The LDS Provo Stake served Pond Town's religious needs until Salem Ward was created in 1877. A red brick church was completed in 1898, remodeled in 1938, and replaced in 1972. The one ward was divided in 1956, and currently there are two local LDS stakes. Education was always important to the settlers, and parents made arrangements for their children to be taught, first in homes and then in a log schoolroom. Several small buildings were used for school, church, and public meetings until the church meetinghouse was built in 1898; it was followed by a new brick school built in 1907. The "Dream Mine" of John Hyrum Koyle, as well as the pond, became synonymous with Salem. Koyle dreamed of a rich ore mine on the hillside and set out to bring his dream to fruition. Selling shares in the venture, Koyle was able to have a deep shaft dug, but ore was never found. See: Ted L. Hanks, Summer Spring: An Historical Perspective of Salem, Utah (1990); Emma N. Huff, Memories That Live (1947).